My First Message is a one-of-a-kind Bible for children that transforms reading into an interactive experience. Filled with vibrant artwork, fun stories, and one of today's most beloved Bible translations, My First Message is changing how families experience devotionals together. The mini-book series brings all the fun and wonder of My First Message into four amazing stories of the Bible. It features cherished Bible stories and characters brought to life in whimsical, vivid detail and includes the same devotional experience contained in the full-length My First Message Bible. The enclosed CD features lively read-along narration for each story. Plus, sing-along songs help kids enjoy these Bible stories through catchy, upbeat tunes - all of which makes Bible learning feel like, well, kid stuff! My First Message: Amazing Stories of the Bible with CD by Eugene Peterson was published by Navpress in September 2007 and is our 16302nd best seller. 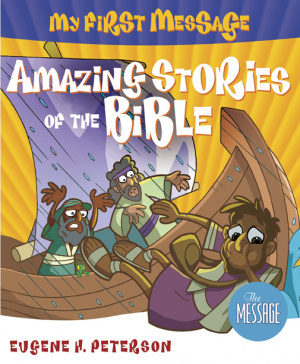 The ISBN for My First Message: Amazing Stories of the Bible with CD is 9781600062353. Be the first to review My First Message: Amazing Stories of the Bible with CD! Got a question? No problem! Just click here to ask us about My First Message: Amazing Stories of the Bible with CD.